Breeze - How to use Breeze. Sample project boards and inspiration. Project board inspiration and examples. There are millions of ways to use and run a project in Breeze. You can use it for software development, marketing, accounting, IT operations, industrial processes, everyday to-dos and more, the possibilities are endless. Just by dividing your workflow into lists will help you to streamline your work and become more efficient. Here are some examples that show you how you can set up your projects. To set goals and accountability in your everyday life you can use a simple board with only three list - Todo, Doing and Done. You can use it for your personal work and for remembering and organizing everyday tasks. You can always extend it with lists like On Hold or Ideas. This simple board helps you to be transparent with your goals and accountable. A time driven board is a modified layout of the basic board. You can use it for planning work and tasks in time. It's perfect when you have to have certain tasks done every day. You can also extend the timeline by using weeks instead of days. Use it to divide your work into weekly doses. Keep an ongoing list of future projects on the left side. Have a list for this week’s tasks, a list for dones, and a list for the week ahead. Set up a board for team retrospectives to take a look back at past tasks and events. This is especially useful when your team is split across the world. You can start with lists Went Well, Needs to Change, Questions & Discussions, Action Items. Everyone adds their tasks to the lists at the beginning of the meeting, things that went well and poorly throughout the week. This layout gives you and your team a great overview at a glance what's on everyone's mind. The hiring process has a lot of stages that are a perfect fit for a Breeze board. You can treat hiring like marketing or sales. Just like there's a marketing or sales funnel you can create hiring funnel. Start your board with lists like New, Interview, Homework, Final interview, Offer made, Hired and customize it to fit your needs. It's visual and it shows you where each applicant is in the hiring funnel. Whether you are building a new product or developing custom software there are many tasks for your team to track and execute. Getting the work done is a continuous process that involves planning, execution and feedback. Keep everyone accountable and on the same page using a board with lists like Ideas, Todo, Doing, QA, Done. Using Breeze for software or product development is a perfect fit, this where it thrives. A product roadmap helps you plan your short-term and long-term business goals. 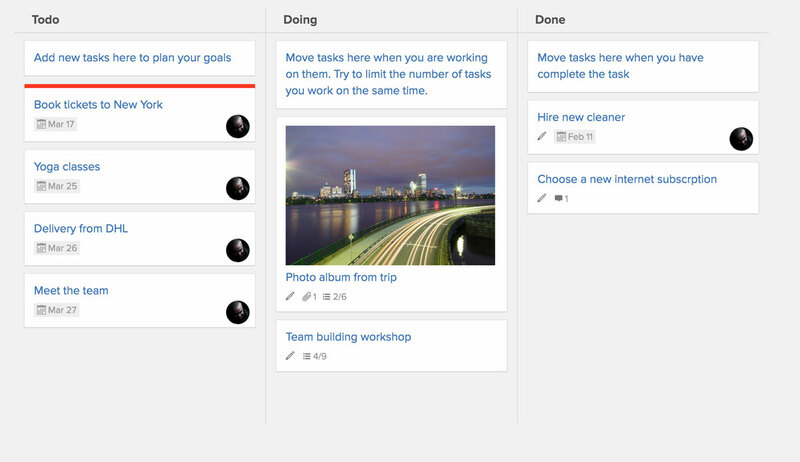 It goes hand in hand with your daily project board, but it gives you a high-level view of you backlog. Start by dividing your product into components, then turn them into lists like Web, Backend, Mobile, API. It's an epic board that lets you track your product vision and the directions you want to take it. This board helps you to prioritize and group tasks on a company level, it gives you focus and clear goals. Understating everyone's progress on a high level brings you closer to company-wide transparency. 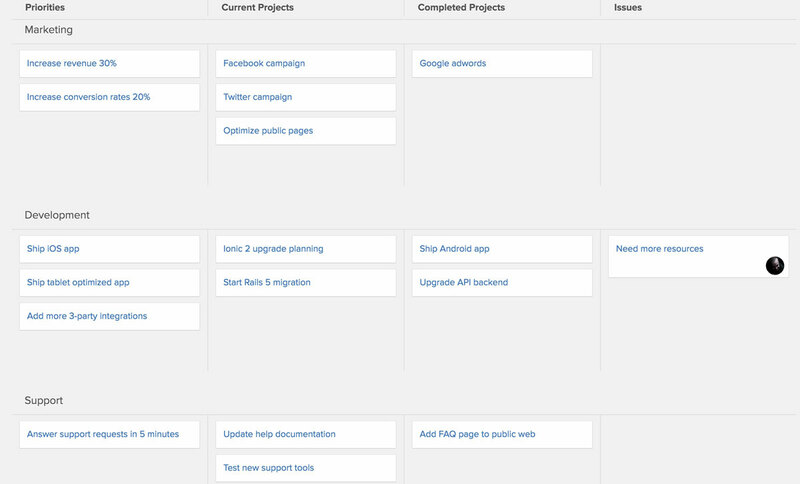 Usually, it's easier to make or improve your project board when you have seen other similar boards. Exploring different project layouts will inspire you to make improvements to your own project and the way your team works. Always try to find a balance between the project process and the real work. Keep the boards simple and short. How are you using Breeze? What kind of processes do you manage and what's your project board layout. Drop us an email at team@breeze.pm and we'll share your ideas with other users.